The Geology & Geography department is on the main floor of the Schimmel/Conrades Science Center, which was dedicated on October 1, 2004. Our classrooms, laboratories, and faculty offices are closely grouped for easy accessibility by students. We are well equipped in reference materials, computers, and teaching and research equipment, all of which are available to students. We have our own library and seminar room with an extensive collection of maps, state geological survey publications, field guidebooks, and journals. We also have our own computer laboratory, with GIS, data and word processing software, and all offices and classrooms are linked to the University’s academic computer system. 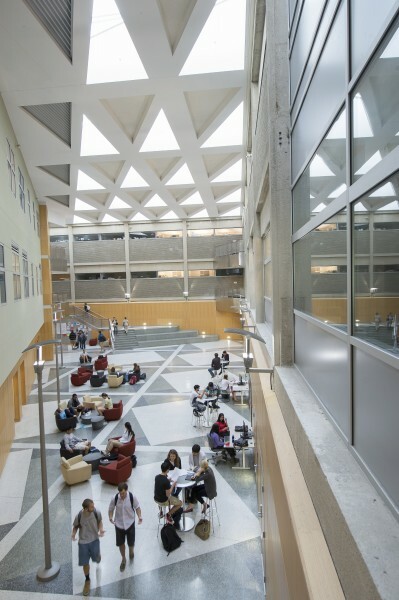 The Hobson Science Library is located steps away from the Geology & Geography department, and has excellent study space and computer access. Beeghly Library, the main library at Ohio Wesleyan, is linked to a consortium of Ohio university libraries providing access to thousands of academic journals, and millions of books. Geographic Information Systems (GIS) and Computer Mapping Laboratory including 15 Pentium PC computers, large and regular format color printers, professional quality Global Positioning System (GPS) hardware, and software including ERSI’s ArcGIS (with Spatial Analyst, 3D Analyst, ArcInfo, and ArcIMS). Our computer lab is available to all students in the department, and includes a lounge area with several sofas and chairs. Our Automated Weather Station (AWS) provides real-time atmospheric data for analysis and understanding of the weather phenomena. Our AWS is mounted on top of the SCSC building for local weather information. Variable pressure Scanning Electron Microscope (LEO 435VP) with energy dispersive x-ray (Link ISIS) and cryopreparation (Oxford) systems (shared with Biology). Petrographic Laboratory including research petrographic microscope (Leitz) with video camera and monitor; student petrographic and stereoscopic microscopes. Fluid inclusion system (Fluid, Inc. USGS Gas-Flow Heating/Freezing unit) for microthermomerty of fluid inclusions in mineral grains. Rock preparation laboratories including automated thin section equipment (Logitech), gold and carbon coater, rock saws, grinders, sieve shakers, ultrasonic cleaner, shatterbox. Fossil Preparation laboratory including microsand blaster (S.S. White Airbrasive Model KSeries II) and related equipment.